On average, a person takes approximately 2,000 steps to travel a distance of one mile. If you think about the uneven surfaces, roots, rocks, and other debris along the hiking trail, the number of steps increases exponentially. With such a long journey ahead, choosing the right socks can actually play a huge role in keeping you comfortable all day long. It also has an impact on whether you will stay blister-free throughout the hike. Hotspots, frostbite, and blisters are legitimate problems that you can easily avoid with a pair of good hiking socks. Hiking socks are a great option if you are a regular hiker since they actually enhance your performance. The cushioning effect that most hiking socks have is enough to ensure that your feet don’t get sore and tired too easily. This helps you complete the toughest hiking trails in the area and still be pumped for more. Once you hike with proper socks, you will definitely realize the difference they make. 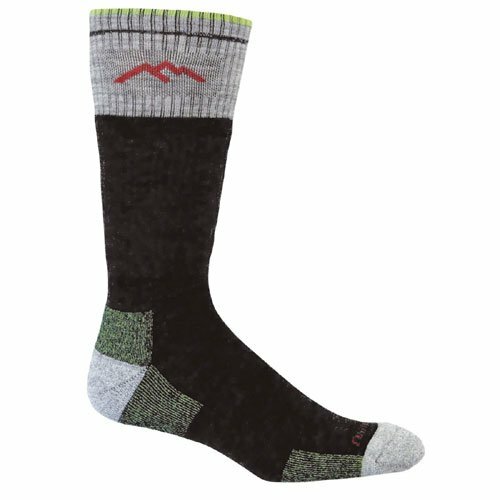 How to Choose Good Hiking Socks? There are many different types of hiking socks that have been crafted by companies all over the world to individually meet the needs for different individuals and trailsthat vary from each other. Here are some of the best ones that you can invest in. The Darn Tough Hiker Boot Sock Cushion is best for long-distance hiking. It has a very great fit, which enhances ones performance. The great fit protects the user from blisters, bunching, and slipping, which protects you during the hike. The hiking sock is also truly seamless so that the sock doesn’t feel uncomfortable. It feels ultra-smooth on the feet. The fine gauge knitting presents really great durability, which means that it doesn’t tear too easily. The material also has such great knitting that it feels really light when you put it on. Hiking socks also need to have fast wicking action so that the feet don’t stay sweaty or develop rashes. The Darn Tough Hiker Boot Sock pulls the moisture away from the skin and dries it quickly. The sock is made from naturally antimicrobial, which means that it repels odor and bacteria. It is made so well that it comes with an unconditional guarantee for life. The soft merino wool blend is supportive of the boots’ shape, making them warm and comfy. 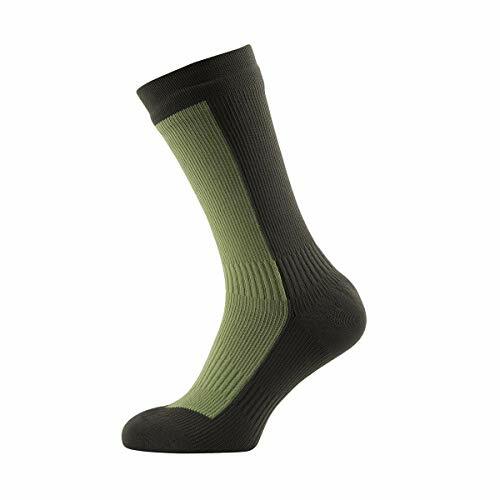 The Smartwool Hiking Light Crew Socks is hailed as one of the most comfortable socks available in the market. They have a classic look and feel, whichmakes them a really nice option for any hike. The socks come with ample cushioning, which protects your heel and sole from shock or impact. The supportive fit also ensures that you don’t get sprains or blisters durin your hike. The toe seam is flat-knit, meaning that the socks have no risk of slipping or bunching up. They remain in perfect condition throughout your hike. The elastic arch brace is also an innovative technique to protect your ankle support. It minimizes the risk of twisting your ankle while you complete a really tricky part of your trek. 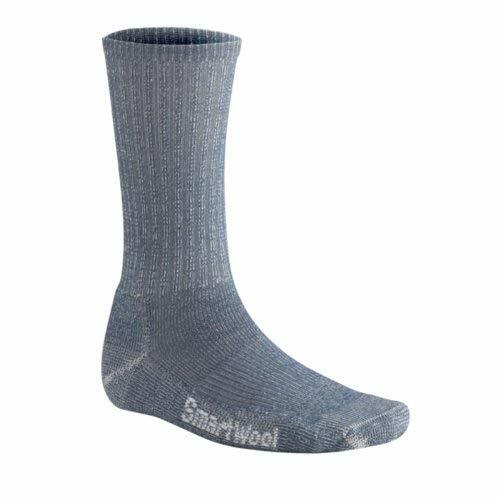 Smartwool is the biggest name among all technical hiking socks for many reasons. Their trekking models are built with the best materials to ensure that you have support and comfort for miles and miles. The high-quality merino wool is also perfect for cushioning effect and seamless socks. The Stance Uncommon Cinder Hike Crew Sock is made from a natural wool fusion blend. This means that it is actually a natural anti-microbial and absorbs the moisture from your feet. The blend has fast action drying and leaves no odors behind. The material is also very durable, which means that it won’t rip or tear that easily. 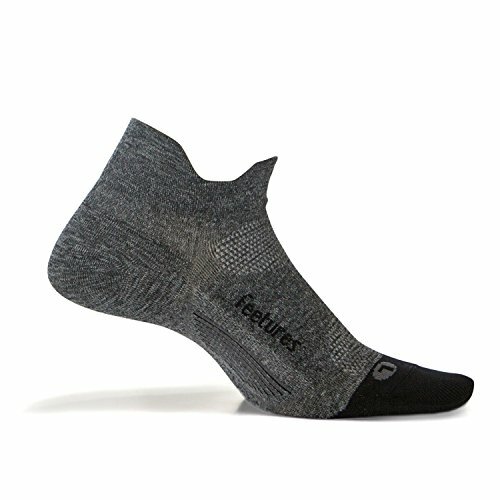 The thickness of the hiking sock is perfect since it provides the wearer with additional cushioning throughout the sock. This ensures that you will stay comfortable every step of the way. The sock will also stay secure on your feet so that no bunching or slipping occurs. The anatomical cushioning also fits perfectly so that you have support and the boots don’t feel uncomfortable. The reinforced heel and toe model of the sock ensures that you don’t get blisters or ankle sprains. The cushioning effect also protects the foot from impact, which would otherwise hurt your feet a lot. The toes also have invisible seams that keep the sock from slipping. The height of the sock goes up to 7 inches till your calf so that you have ample support. For many people, the origin of their products is really important. Farm to Feet Damascus Lightweight Crew Socks is a great example of how companies can produce an efficient and performance-based hiking sock with locally-sourced materials. It has a great targeted cushioning effect so that your feet are comfortable all day long. This will ensure that you have no trouble hiking long distance or steep areas. 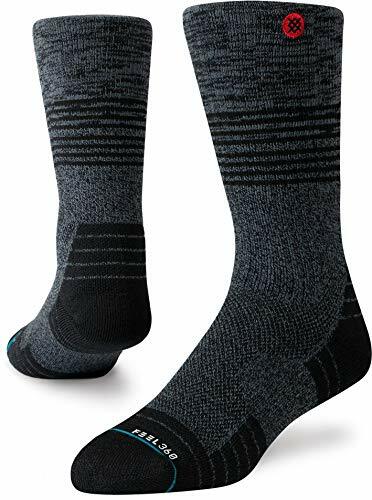 The compression of the sock is ideal for short and long hikes; it significantly reduces fatigue during the hike since the foot doesn’t feel too much pressure. The length of the sock is also perfect since the height provides support to the foot. The seamless toe closure prevents blisters that usually occur from friction. The low-stress seam increases the durability of the sock as well. The natural materials used in the sock ensure that odor remains under control since all the moisture is expelled more efficiently. 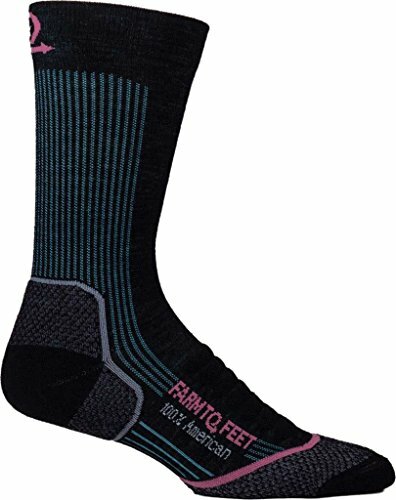 This sophisticated sock by Farm to Feet will ensure that your adventure and exploration goes well! 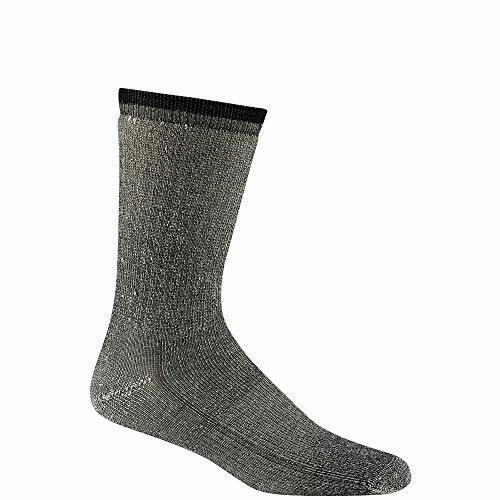 The Wigwam Merino Wool Comfort Hiker is the most affordable hiking sock on the market. The technical materials of the Wigwam are great, making them a perfect option for use that spans over years. The high-quality materials ensure that you won’t face wear and tear that easily. They use Merino wool like any other high-performance sock, which feels soft and comfortable to use. The sock is also resistant to odors. It expels the moisture away from the foot and the natural material doesn’t retain the odor at all. While hiking, you will definitely face your fair share of streams, fens, bogs, and pools. Wet feet are inevitable during a hike, so the Sealskinz Waterproof Mid length socks are an important addition to your outfit. They are also windproof but also breathable. The nylon and elastane blend creates a hydrophilic membrane that protects the feet. The dryness that it provides is an important factor since it prevents blisters and rashes. The merino blend with acrylic and nylon is super soft and comfortable to put on as well. The Sealskinz socks are also warm, which is perfect for all sorts of trekking and hiking conditions. The inner membrane of the sock protects the feet from dirt, dust, and water. This keeps you going in any weather or environment conditions. If you plan on wearing shorts on your hike or are generally akin to ankle socks, then these are the types for you. The FITS Light Runner is made with a patented Full Contact Fit design. This means that it hugs your foot securely in such a way that there is no chance of it slipping down the shoe or bunching up. This helps alleviate performance so that you can meet all your fitness or hiking goals. The socks have a low-cut design which is stylish and looks streamlined. It goes really well with all your jogging, hiking, and running shoes. The sock has a narrow welt bang that prevents it from slipping and it peeks out just above the shoe so that it won’t overpower the whole look. 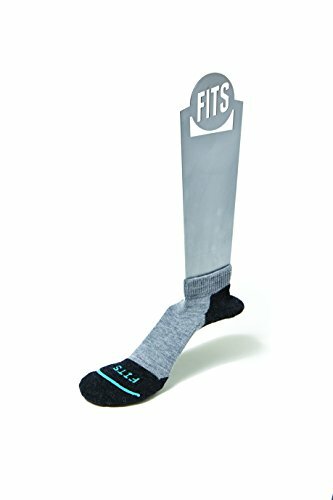 FITS expertly constructed the hiking sock to ensure that you feel as comfortable as possible. You don’t want to stop mid-way on your hiking trail because your feet are hurting. The high impact cushioning effect on the sock reduces the shock felt at the heel and toe area. This offers you great support while you are hiking so that you can keep up at a great pace. The socks are also made from a really great breathable fabric. They are designed to last for a very long time and this fabric ensures their durability. The material is lightweight and stretchy which prevents them from being too heavy. The lightness of the sock also reduces the friction against your foot, which is the best way to avoid blisters as well. It will feel luxuriously soft against your skin while you hike. The FITS hiking socks are the best ones for speed hiking since they eliminate friction and enhance performance. If you are planning on going on a long trek then this sock is the best option for you. The InjinjiToesocks have a unique separated toe design that you won’t find in many socks. It is ideal for hiking since it means less friction and rubbing. The skin-to-skin contact is low so means that there is less chance for blisters. The style may feel strange at first since you aren’t used to it but soon you will find that it is incredibly comfortable. 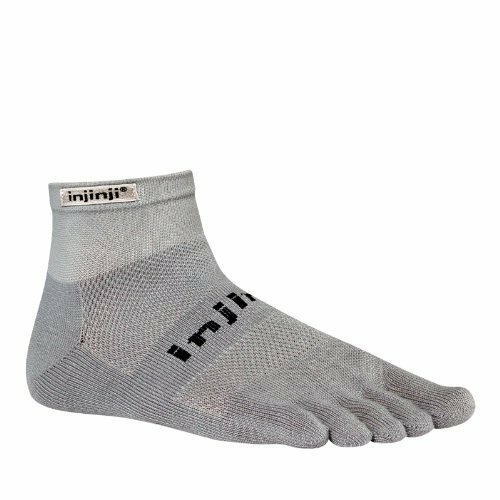 The Injinji sock has a mesh top which allows breathability. It keeps your foot dry and prevents moisture from creating rashes. The high-quality material has a really luxuriously soft feeling. The supportive arch compression also protects the heel from impact, reducing the chances of a sprain. The Feetures! Elite Ultra-Light socks have a very unique anatomical design. This allows the sock to better fit the foot and shapes itself according to the boot. This delivers protection against blisters and rashes since the foot doesn’t face friction. The fit also feels really comfortable, which is further enhanced by the seamless toe. The lack of seam ensures that the sock doesn’t bunch up or slip when you are hiking. The minimum weight of the sock also means that it takes up less room in the shoe. This streamlined design keeps your feet cool. The super thin design even works under the most intense conditions and the hottest days of the year. The iWick fibers are the best way to keep your feet cool and dry since they do a really superior job of wicking the moisture out of the foot. These socks also have zone-specific compression which provides you with extra support and comfort where you need it the most. This ensures that you don’t tire out easily and can enjoy the hike. The Feetures! has quality socks that will enhance your performance and make sure you are comfortable. Hiking is one of the most fun activities in the world. It helps you reconnect with nature and explore the area around you. Even though hiking is great, it can leave you with your feet feeling quite sore. With any of the socks above, you can end up saving yourself a lot of trouble. These hiking socks will allow you to have a better overall experience during your hiking trip, which is what a hike is all about.